How promising does 2017-18 look for Florida Gulf Coast University basketball? Well, one telling clue is the Eagles’ preseason promotional video for season-ticket sales. Men’s basketball Coach Joe Dooley enters his fifth season with three of the top four scorers returning from a record-setting, 26-win team that swept the Atlantic Sun Conference regular-season and tournament championships and earned an automatic NCAA Tournament bid — including Brandon Goodwin, FGCU’s single-season scoring record holder and ASUN Newcomer of the Year. Yet the “host” of the video who first introduces viewers to Eagle basketball 2017-18 is a new face of the program — a kid who didn’t even play in 2016-17. Senior Brandon Goodwin (0) returns after averaging an FGCU record 18.5 points per game. Meet Ricky Doyle, a junior who will finally introduce his much-heralded, 6-foot-10, 250-pound power game both to FGCU fans and a wary slew of ASUN opponents after transferring back to Southwest Florida (he’s a Cape Coral native and Bishop Verot High School grad) from the University of Michigan and sitting out a season under NCAA rules. He’s the pleasant young man seated in the Alico Arena stands who greets potential ticket buyers at the start of the video before yielding the stage to other Eagle men and women basketball stars, most notably 6-foot-2 senior guard Goodwin, the greatest one-year scorer in FGCU history with 629 points (18.5 per game). Only a prize catch such as Doyle, who ESPN ranked as one of the top players in the country at his position coming out of high school, could relegate a talent such as Goodwin, who Dooley said “had one of the best, if not the best, season in program history,” to co-star status, at least in the video pep rally. 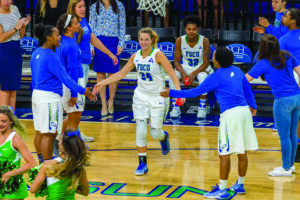 Heck, even the video’s leading ladies — FGCU women’s basketball seniors Taylor Gradinjan and Rosemarie Julien, the team’s top returning scorer (11 ppg) — and their team’s equally inspiring resume of an identical 26 wins, ASUN Tournament title and NCAA bid, are introduced on camera only after the new Big Man on Campus debuts. FGCU seniors Taylor Gradinjan (24) and Rosemarie Julien (32) return to lead a women’s team that won 26 games last season. Doyle’s starring role in the preseason hype is no disrespect to Goodwin, junior guard Zach Johnson (11.9 ppg) or senior guard Christian Terrell (10.2 ppg), the other top returning scorers. Nor is it a slap at FGCU women stars Gradinjan, a guard; Julien, a forward; guard Erica Nelson (9.2 ppg), or guard China Dow (8.7 ppg, 4.5 rebounds pg), leaders of a returning group that got hot as the 2016-17 season progressed under Coach Karl Smesko, who arguably did his finest job last year — even though he didn’t add to his seven ASUN Coach of the Year honors. Instead, all the basketball coaching bling at FGCU after 2016-17 went to Dooley, who was named top men’s ASUN coach and National Association of Basketball Coaches District 3 Coach of the Year. Indeed, what Doyle’s signing and starring role in the official Eagles season-ticket push means is that FGCU — which consistently backs up all the men’s “Dunk City” and women’s “Raining Threes” hype with 20-win seasons, ASUN dominance and postseason trips out of both locker rooms — is on to the next step as an emerging mid-major basketball power and worthy destination for top collegiate hoops talent nationwide. Build the programs, and they will come. On the men’s side alone, more evidence of FGCU’s rising national profile is another transfer, junior Michael Gilmore, who brings pedigree as the nephew of basketball legend Artis Gilmore along with an attacking game on a 6-foot-10 frame as a transfer from Virginia Commonwealth and Miami. Two other transfers with collegiate experience include another 6-foot-10 player, sophomore Brady Ernst out of Indian Hills Community College and Iowa State; and Dinero Mercurius, a 6-foot-4 junior billed as a pure shooter out of Daytona State and South Florida. Mix these players with incoming freshmen Darnell Rogers and Brian Thomas, both highly touted, and sophomore returnees Christian Carlyle and RaySean Scott Jr., and you quickly see why this is unquestionably the team to beat in the ASUN — and perhaps beyond, especially with 6-foot-8, four-star recruit and University of Nevada-Las Vegas transfer Troy Baxter bringing three years of eligibility starting in 2018-19. Flip over to Smesko’s always-strong women’s team, and besides Gradinjan, Julien and Dow, the Eagles bring back their leading rebounder, sophomore Tytionia Adderly; and senior guard Jessica Cattani, who averaged almost seven points per game. A transfer who is eligible this season after earning her undergraduate degree at Houston Baptist, guard Lisa Zderadicka, is expected to make an immediate impact after leading her former team in scoring (11 ppg), assists and steals; and another transfer was granted a second season with FGCU, senior guard Mikala McGhee out of George Mason. On the horizon in 2018-19 are two more transfers — former Dunbar High star Keri Jewett-Giles, who is coming to FGCU from Southern Mississippi; and sharpshooter Kerstie Philis, who joins the Eagles from Wagner — along with a collection of recruits. The bottom line is that there is little to suggest FGCU’s women will not continue a string of 13 seasons of at least 20 wins, and seven consecutive years with at least 25 wins, under one of the winningest coaches in the sport’s entire history. Smesko has won more than 400 games at FGCU — including an incredible 93-3 ASUN record the past six years — and decided to stay with the program he founded after turning down Southern California of the PAC-12, which five years ago hired Dunk City architect Andy Enfield away from FGCU as men’s basketball coach. 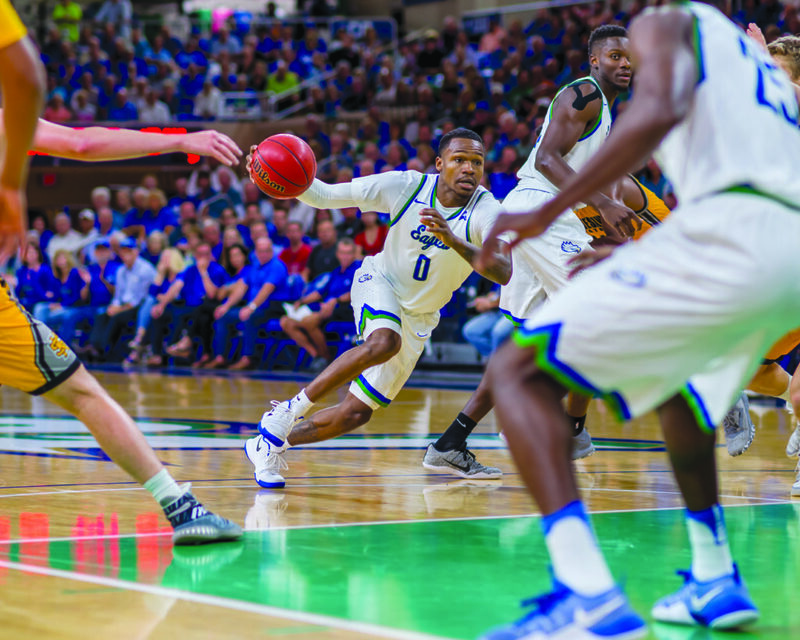 It all adds up to what likely will be a winter of wonder for FGCU fans at Alico Arena, which has become a house of horrors for visiting teams with the men (16-3 in 2016-17) and women (17-1) increasingly tough to beat at home. Toss in the best — and likely toughest — regular-season schedules either team has played, including home non-conference dates with power schools Illinois State (men, Nov. 11), Illinois (women, Nov. 12), Middle Tennessee (men, Dec. 2) and Kentucky (women, Dec. 8), and it’s no wonder FGCU Athletics is beating the drum hard on ticket sales. Sounds like the perfect season-ticket sales pitch. Just tell your friendly FGCU ticket rep that video stars Ricky, Brandon, Taylor and Rosemarie sent you.